If you say “I wish there was a tool to help with this!” multiple times in your day-to-day role as a marketer, you’re not alone. Marketers are always looking for ways to save time, be more productive, and improve their results–which is why the average marketer has over 100 pieces of software in their toolbox. But with thousands of new applications being released every week, it’s tricky to know which is worth your cash investment. You need to know the software you’re pitching to your boss or client will deliver long-term ROI, right? 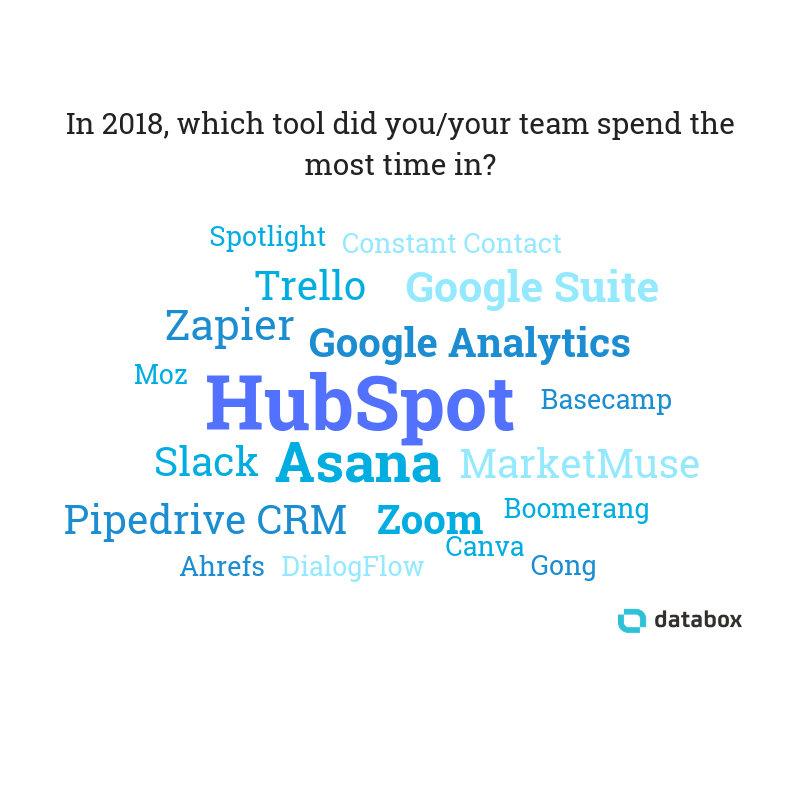 That’s why we asked 31 marketers to share the best, new tools their team adopted in 2018. From assisting with content creation to handling in-house communication across their department, we’ve broken their answers down into five main categories. …or continue scrolling to browse them all. Ever fall victim to putting tasks on the backburner because you either: don’t have the in-house expertise, or, time/effort to get it done? You might benefit from these six pieces of software that marketers use to solve complex tasks. “Pumping out fresh, relevant content is not always so easy”, says Nate Masterson of Maple Holistics. But Nate has found a solution in Google Trends. That’s not the only feature on offer, though. …Talk about making a complex task easier. Search for any marketing tool and I’ll bet Google Analytics makes its way onto the shortlist. He adds: “Additionally, they helped us track pageviews by author to further measure the efforts of our content writers”–making the software hybrid a fantastic option for content marketers who’re unsure whether each member of their team is responsible for driving results. Graphic designing is a fantastic skill to have in your team–but it comes at a cost. The average salary for a graphic designer in the U.S. is $43,068 per year, but Referral Rock‘s Megan Mosley began using Design Pickle as an alternative in 2018. Speaking of design, you might struggle to make small tweaks to your website (especially if you don’t have a web developer on your team). The chatbot industry is expected to surpass $1.34 billion by 2024. And with the opportunity to chat with customers in real-time around the clock being a huge advantage for customers, it’s no surprise TurboTax Assistant has made its way onto the shortlist. Often, a new tool you bring into your toolkit needs to work for multiple employees. Whether the software facilitates work conversations or allows multiple team members to access it at the same time, the ease of providing everyone with an account is likely a huge bonus. 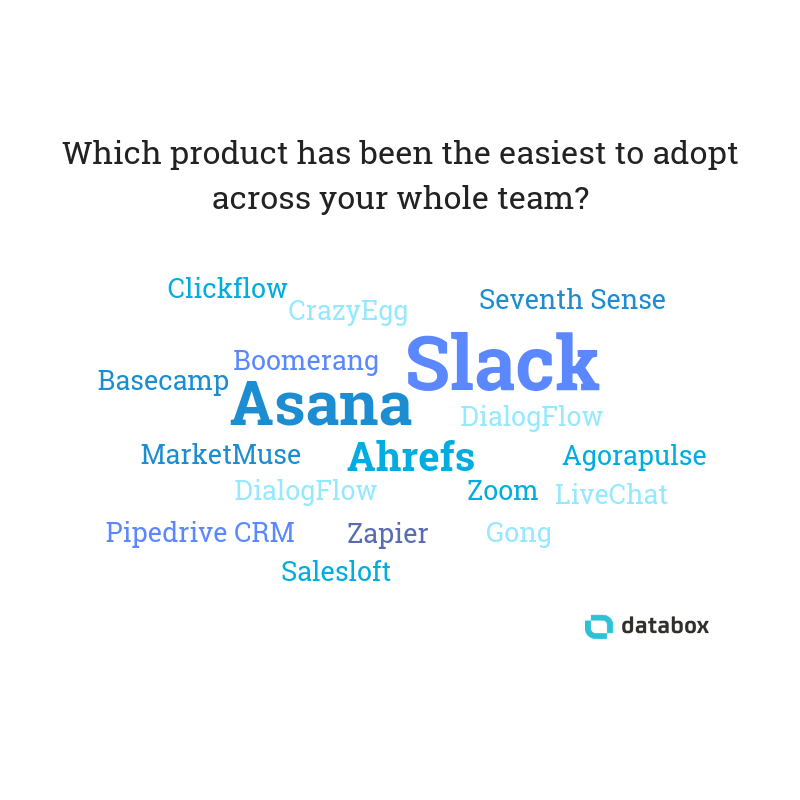 These four marketers share which tools have been easiest to adopt across their whole team. Chances are, you’ve heard the word “Slack” crop-up once or twice. 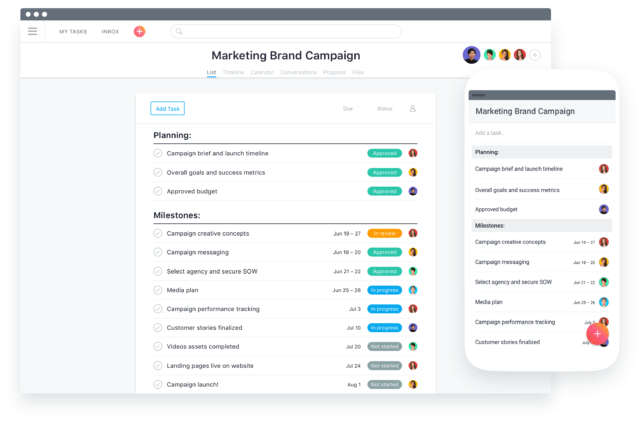 It’s one of the largest team communication software in the world, boasting over 9 million weekly active users–including New Breed. Struggling to manage your workload? I know the feeling: Searching high and low to find a solution to solve your marketing problems, only to find the perfect piece of software that you wondered how you previously lived without. It’s a common feeling for the marketers we interviewed, too. “Ahrefs has been a game changer for our team in 2018″, says Mackenzie Thompson of National Health Care Provider Solutions. Looking to learn more about the visitors landing on your website? …Name fail to ring a bell? “Part of our sales process is to audit the prospect’s analytics, ad accounts, website, and competitors. Initially, we had a specialist who’d spend anywhere from 4 to 12 hrs on each audit. Spotlight automates this audit and spits out a cross-channel report that even includes an auto-generated executive summary, so what once took a minimum of 4hrs of paid analyst time now takes 5-10min and our sales team can handle it themselves! Monday reporting – even with dashboard tools – can be maddening. Spotlight allows us to automate reporting across any channel, from LinkedIn Ads to SalesForce to Airtable to Google Search Console and everything in between. The real kicker here is that it also calls out the most significant insights and generates an executive summary. When you’re a business, every minute of the working day counts. “Hubspot is a must for any business, as the workflow functionalities, CRM integrations, and sales functionalities have helped me automate countless tasks, and qualify leads enabling 1 person to do the work of 10″, says Daniel Lynch from Empathy First Media. But it’s not just the HubSpot software that’s impressed P5 Marketing‘s Robert Donnell. 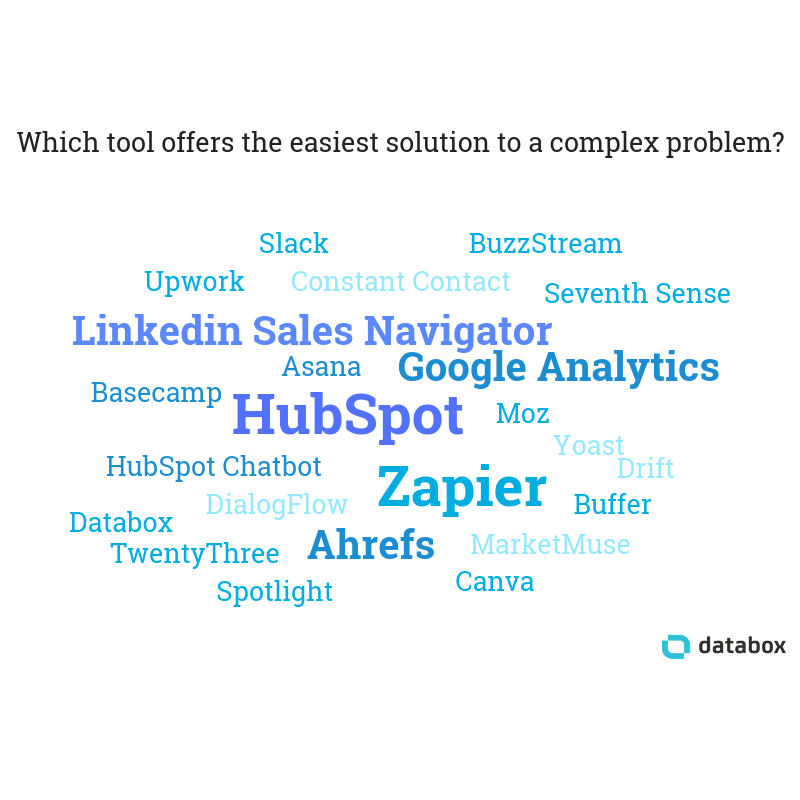 HubSpot offer tons of integrations with other ssoftware. When Marc Herschberger, part of the team at Revenue River, “recognized a trend of fewer people filling out forms for content”, he turned to Drift–and helped “drive major increases in conversions at both the top and bottom of the funnel”, as a result. Are you one of the 55% of marketers that struggle with identifying leads to convert? Over 2.46 billion people have at least one social media account, so struggling to stay up-to-date with your social activity is a common problem for marketers. 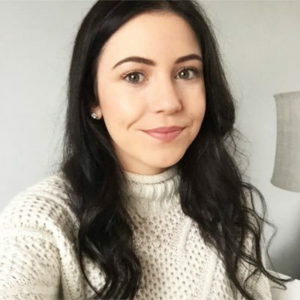 Natalie Hagen, of TakeLessons, began using Agorapulse in 2018, to help. She says the tool “has been instrumental in helping us keep track of all of our social media interactions”–a huge helping hand for her team, especially when they “have 20 various social media accounts (from different platforms)”. ROI is likely to be a huge metric your marketing team strives for. But it doesn’t just apply to strategy or ad spend. You’ll need to make sure the software you’re investing in is delivering results, too. 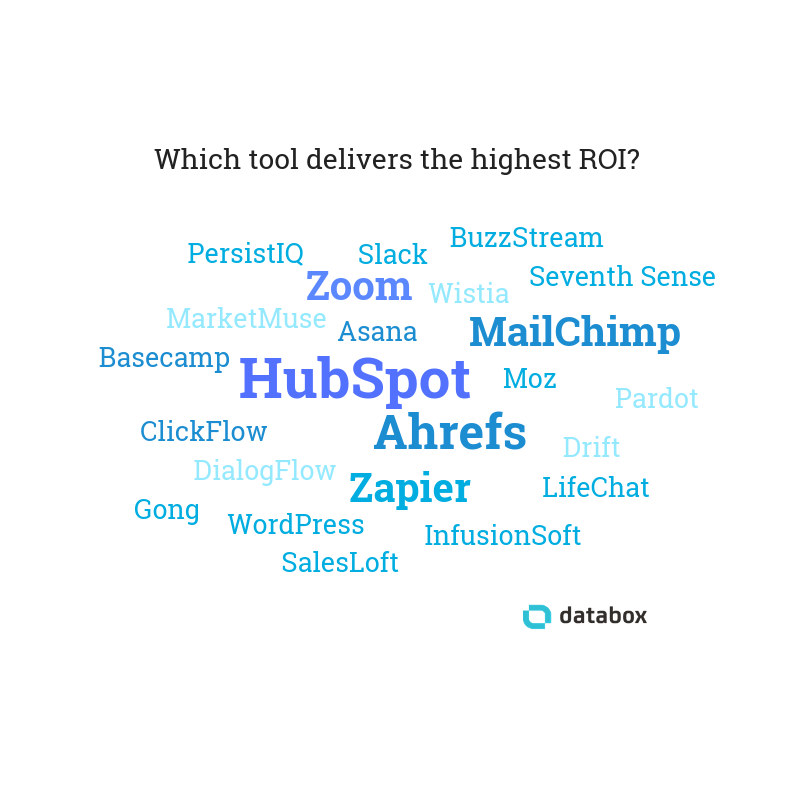 These six marketers found a tool that gives a bang for their buck. Zapier is a tool that allows marketers to automate tasks across various apps. But why does it form such an important part of his toolstack? If you’re looking to track your competitors’ marketing activity, it might be worth investigating Jennifer Noto (of Carolinas IT)’s , tool of the year: SpyFu. Does your company invest heavily in video marketing? According to data collected by Wyzowl, 87% of businesses now use video as a marketing tool, and 91% of video marketers consider video an important part of their marketing strategy (an increase from 85% in 2018). One piece of video you might invest in is explainer videos. Katie Morrissey, recommends Soapbox–a tool that Wistia‘s very own team built to help other marketers build professional presentation videos. A tool needs to massively impress us to continue using it, right? 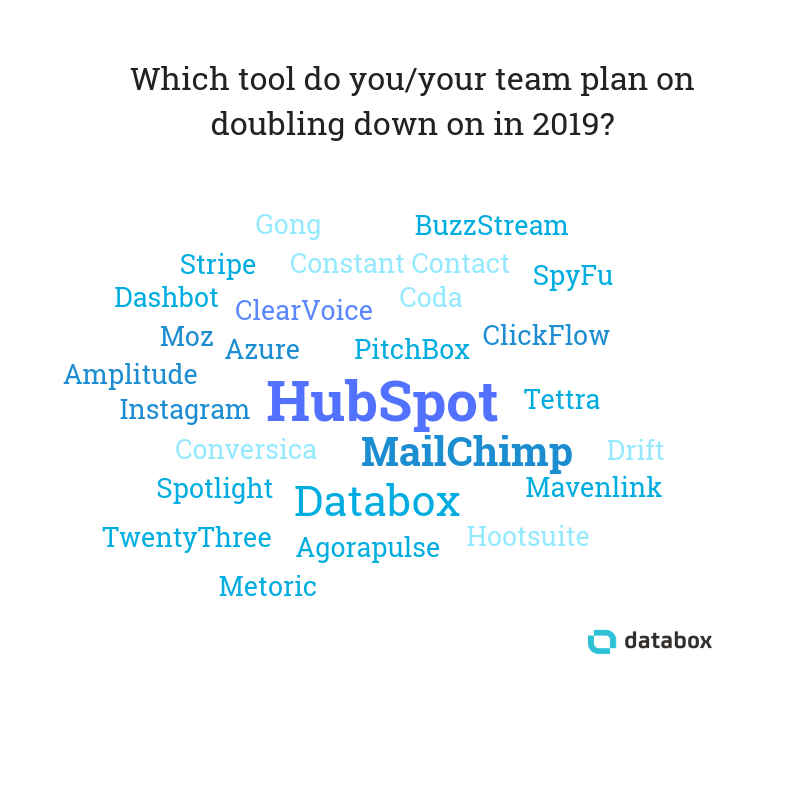 Luckily, these four marketers hit the jackpot–and plan to rely on their software of choice in 2019 and beyond. “We needed to find an easy way to upload, promote, distribute on multiple channels, and measure our video sales, marketing, and customer success videos”, explains Impulse Creative‘s George B Thomas. That’s when their team settled on Drift. MarketMuse is a content marketing tool that crafts unique content using artificial intelligence (AI). She explains: “MarketMuse uses AI and machine learning to provide a robust analysis of your content, show you where the holes in topic coverage are, and help you determine which keywords you need to include for the topics that you write about, leading to more relevant, helpful, high-quality content. But for Sarah, it wasn’t just a tool her company failed to see a return on. It’s a tool that continues to drive incredible results.